Ohh and based on my outdoor setup above, any idea how the black flush works? The specs say it comes standard but I don't see anything there that would activate any type of spray heads or flush system inside the tank. I am sure someone is asking "didn't the dealer walk you through this" but I bought from a dealer 1,200 miles away so unfortunately this is what I have to deal with. You both are geniuses lol. My 4th trip out to look in the rain and yes it is next to my basement (first time I heard it called that lol). Undid 2 screws and this is what I see.. So to turn the bypass on, I shut the cold line off at the bottom and the hot line off at the top and turn the middle line open, correct? Regardless, this is only if I pump the pink stuff in though, right? As of now I only put some in my sink, toilet and shower so there is nothing in the water lines. I thought about buying a small pump and just pumping the rest of the water that is sitting in the hot water tank out even though the manual says a couple of liters is ok if it freezes. I am trying to winterize my 2015 Wind Jammer 3008wk. It has an outside connection for winterizing. However when I it up to a bucket of antifreeze, I go inside and turn a valve from tank to outlet and then start the pump. The pump sounds like it is on, but there is nothing being sucked through. Help? Yes Blwnsmoke that is right! Somewhere near your water pump you should have an anti freeze pump in line with bypass/ shut off. You simply switch the bypass from the freshwater tank, open the anti freeze valve...put the hose in a gal of the pink & turn the pump on. How do you know it's a connection for winterizing? You are correct.. don't I feel dumb as I didn't reread the damn sticker. The top valve is the flush valve. The sticker reads "Caution - Do not use the tank flush valves unless the fully termination valve is in the open position. May result in an unsanitary condition leading to illness or personal injury". So this may be my last question now. So I hook up the water hose to that top valve and turn the water on. What is the "fully termination valve"?? I'm sure it is just terminology I'm not familiar with. Is this just the black tank valve that needs to be open so it doesn't overfill? I think i'm finally learning lmao. If you look at my picture with the outdoor shower, I have a specific line for the antifreeze which is the round knob on the top right. I undo that and I have a hose adapter that came with the camper. It screws onto that outlet and has about 2 feet worth of hose. 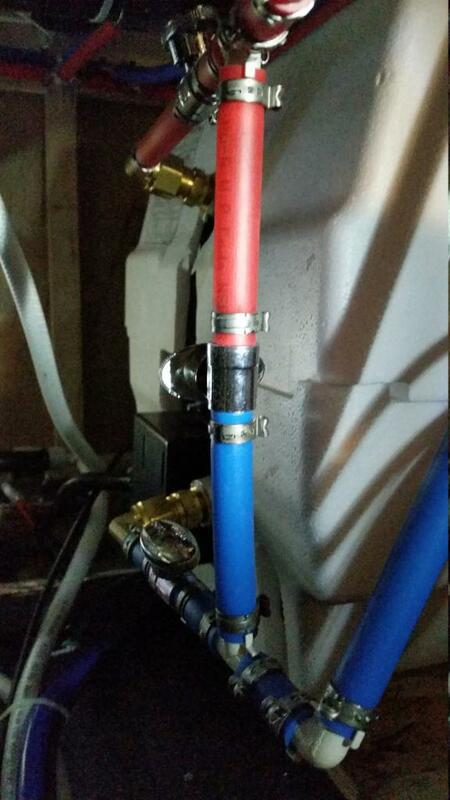 The hose goes into the gallon of antifreeze, turn the pump on and bypass the hot water tank (which I just learned where it is tonight lol) and it is supposed to pump the antifreeze into the camper. I haven't tried mine because again, I'm trying to do it without but from my understanding, that is how it is supposed to work. 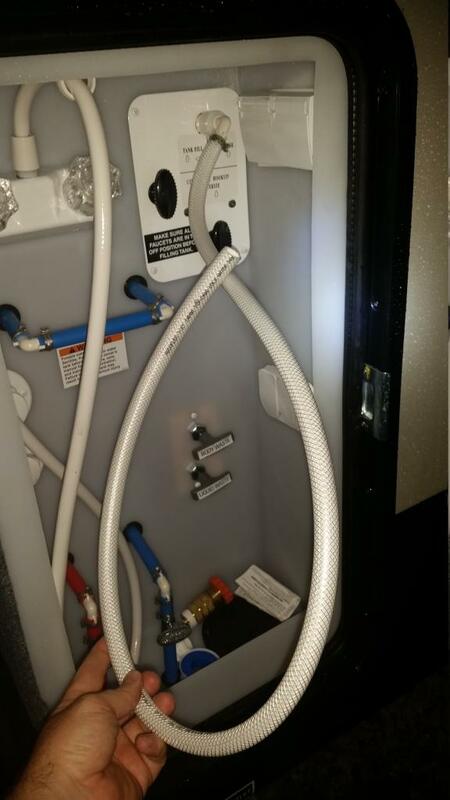 Here is the hose hooked up now..
Read post 17 that I just made... You are going to make me go back out in the rain and look further to see if it is a separate pump lol. Be back in 5 minutes. Correct, just turn them opposite of what they are now. On your water heater there is a plastic plug with a green X, remove it and open the pressure relief valve.